In today’s digital universe, information is energy, and vice versa. That’s true in a literal sense, in terms of the electrons and bursts of light that represent the ones and zeros that make up the world’s digital data and network traffic. It’s also true in a broader sense, in terms of the electricity that all of our new information and communication technology (ICT) is sucking out of the grid. 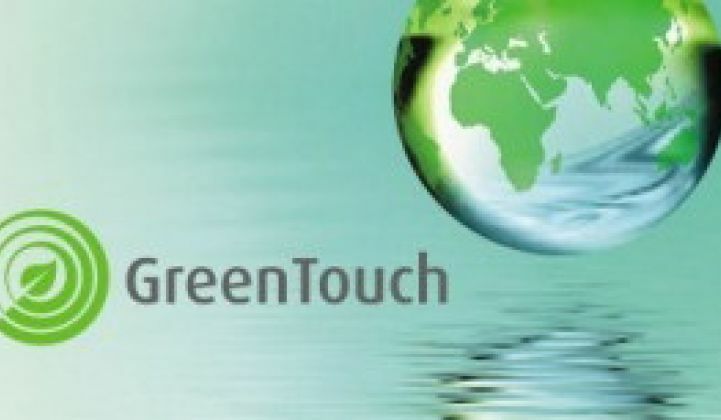 The GreenTouch consortium, an industry group featuring members including Alcatel-Lucent, France Telecom, Fujitsu, Huawei, NTT and Vodafone, has spent the past three years working on ideas to cut those growing power demands, sometimes in dramatic fashion. In its latest 2013 update (PDF), GreenTouch laid out a program that it says could cut overall networking power consumption by 90 percent by 2020. In other words, GreenTouch is proposing a global network that uses one-tenth of the energy of today’s technology, while still accommodating all the growth anticipated for the rest of the decade. Of course, underlying that headline figure are a complicated series of technology advances, ranging from the way neighborhood wireless nodes are configured to new ways to make fiber-to-home digital TV set-top boxes much more efficient, that must be rolled out in concert to achieve the greatest savings. Given that electricity use by ICT and networking technologies contribute only about 2 percent to 2.5 percent of global greenhouse gas emissions today, according to industry estimates, it may not seem the biggest or most promising target for investment, compared to, say, buildings or transportation. But for network owners and operators themselves, energy plays a much bigger role, Thierry Klein, GreenTouch technical committee chair and green research chief at Bell Labs/Alcatel-Lucent, said in an interview last month. Those energy costs can range from about 7 percent of overall operating expenses for networks in mature markets like the United States, Europe and Japan, where power is reliable if not always cheap, to as high as 20 percent in emerging markets, where cell towers and switching stations need a lot more diesel generators and other backup investment amidst an unreliable power delivery infrastructure, he said. - Small cells for dense urban environments. Today’s cellular towers and mobile networks were designed for reliability and broad, overlapping coverage, not for efficiency. But spacing your central networking nodes at 1-mile to 2-mile increments has a big drawback, Klein noted: it massively boosts the energy requirements of your network. That’s because wireless transmission requires much more power in relationship to the distance it seeks to cover, he said -- and likewise, much less power as those distances decrease. Replace square-miles of coverage with a bunch of smaller nodes spaced in quarter-mile or closer networks, and the energy savings could far outweigh the investment, he said. The trick in such small-cell architectures, of course, is to continue to ensure reliability, he said. That’s why the consortium has specified dense urban environments as the likeliest application for small-cell deployments. - Dynamic allocation of resources. Another nice thing about small-cell architectures, Klein noted, is that you can potentially turn each node off when nobody’s using it. Today’s systems are pretty much always on, or at least are running at about 75 percent of their maximum power draw, even when they’re handling very little or no traffic, he said. The same thing goes for wireline and core network equipment, of course. Optimizing the entire, end-to-end operation of all that equipment based on traffic flow and energy needs is a big challenge, but one that could cut power use significantly overall, he said. - Discontinuous transmissions during periods without traffic. Of course, messing with device power is a tricky matter for an always-on network. GreenTouch has specified a set of operating parameters and “power follows load” concepts to handle that, and is also looking at ways to alter the actual flow of data to take advantage of efficiency opportunities. One way to do that is to alter the operating points of amplifiers and other equipment, on very fine timescales, to match the microsecond ebbs and flows of data traffic, he said. Of course, issues that could arise, such as the heat stress effects on equipment materials of ramping power up and down, remain “research challenges,” he said. - The Bit Interleaved Passive Optical Network (Bi-PON). We covered GreenTouch’s Bi-PON concept last summer, but in simple terms, it’s an as-yet-experimental way to make home-fiber-optic network connections much more efficient by adding time as a dimension. Today’s optical networks operate in a manner akin to routing the entire post office’s flow of mail through your door, and asking you to pick which letters are addressed to you, Klein explained. At least in today’s PONs like Verizon’s FiOS service and others, each home set-top box or router has to check the header of each packet before it knows which data it needs. Bi-PON, by contrast, puts each set-top box in a particular time-slot, and asks it only to search those packets that are sent during those microsecond-wide periods, he said ("time-division multiplexing" is the term of art here). Alcatel-Lucent tested it out in the lab last year, he said, but it’s definitely far from commercial adoption. It’s important to remember, however, that the same general IT efficiency improvements that could yield better metrics overall are also subject to Jevons paradox. That’s the idea that the more efficient (and thus cheaper) a resource gets, the more heavily it’s exploited, which can often lead to an overall increase in consumption. In that light, it’s a good thing that groups like GreenTouch are working to get ahead of the coming boom in growth.